This week on my Instagram stories, I’ve been sharing a lot of behind-the-scenes peeks at my meal prep. 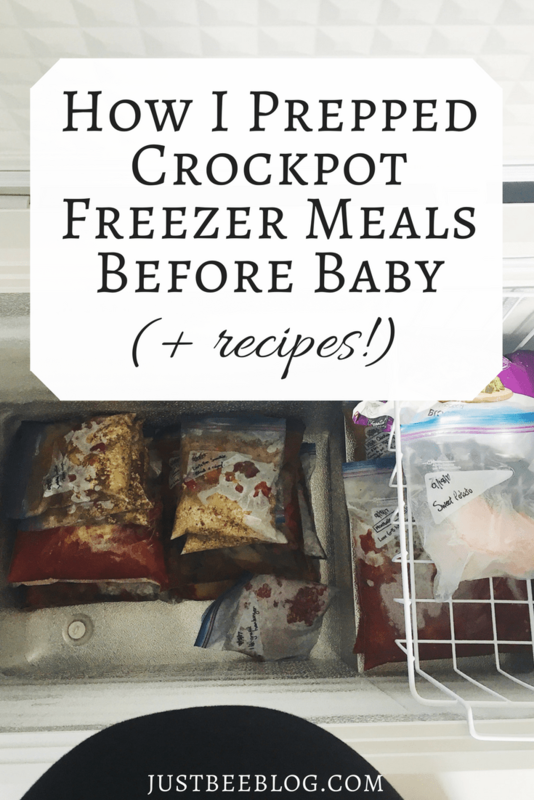 I’ve been working hard on getting some meals ready and in the freezer for when our baby comes! She’ll be here in 3-ish weeks, which means it’s really crunch time! 🙂 When I asked you on Instagram if you’d like to see a blog post about all of this crockpot freezer meal prep, I got a ton of positive responses! So, here’s the post! I’ll be sharing my whole prep process, from start to finish, AND the recipes I chose! I’ve done freezer meal prep sessions before, and totally felt it was worth the time and effort! Unfortunately – and rather ironically – with the busyness of life this past year, I fell away from doing crockpot meals with consistency. But they are SO HELPFUL. It is just wonderful being able to dump a bag of food into the crockpot, walk away, and let supper cook itself. Not to mention, the house gets filled with wonderful aromas, making you look forward to supper! We just got a chest freezer so now I have MUCH more freezer space than I’ve ever had before!! (As in, it’s more than just the top little portion of our fridge now.) I could do a happy dance just thinking about it! 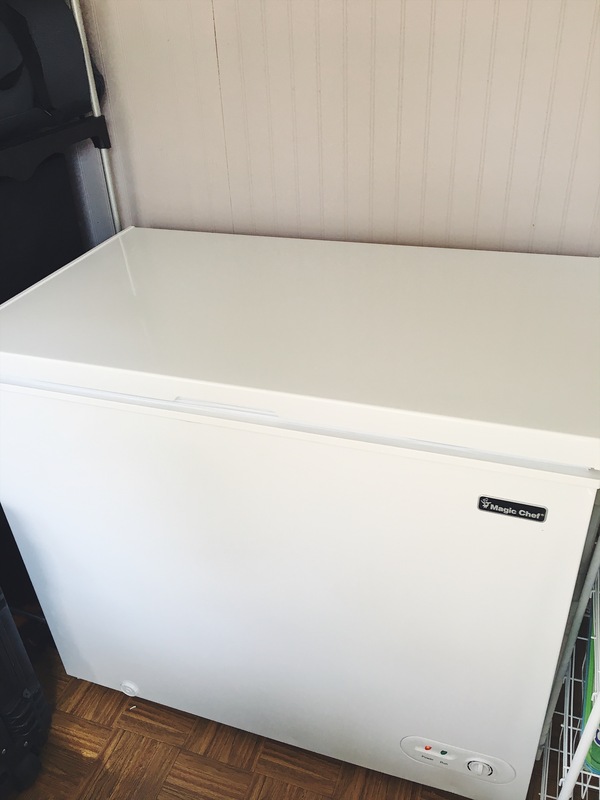 🙂 It’s not a massive freezer, but it will REALLY make a difference in the amount of frozen items we have around! I made 13 freezer bags during my prep session this week – and this doesn’t count all of those smoothie bags I also listed below! It took me an entire afternoon, but I did have a lot of fresh ingredients to chop! Plus, I’m 37 weeks pregnant and I think I took my time a bit more than I normally would. I’m thinking each recipe/freezer bag will give us 1-2 meals. That’s not too bad! 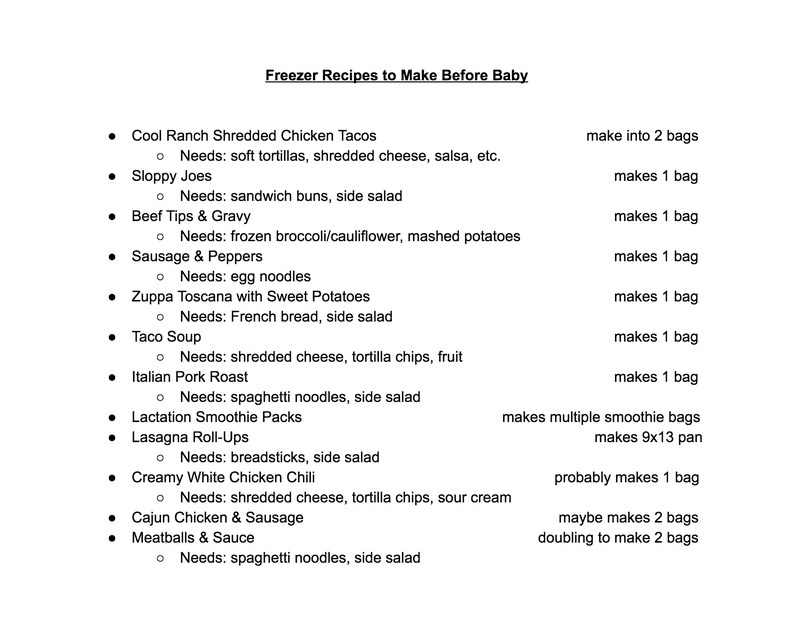 A couple of these weren’t specified as freezer recipes, but they were similar enough to other crockpot freezer meals I’ve prepared that I felt comfortable converting them into freezer meals. 🙂 Probably my favorite website to find a bunch of free freezer crockpot meals would be New Leaf Wellness. She has so, so many recipes! The reason I didn’t solely make her recipes is based on preference — some of the meals sounded more like our style than others…plus, I like discovering recipes from different websites! Sausage & Peppers — it’s #3 or page 6 in this document. Zuppa Toscana With Sweet Potatoes — it’s #3 or page 6 in this document. Taco Soup — it’s #23 or page 25 in this document. Lactation Smoothie Packs — this recipe is a long ways down on the page. Lasagna Roll-Ups — this one is also a ways down on the page. 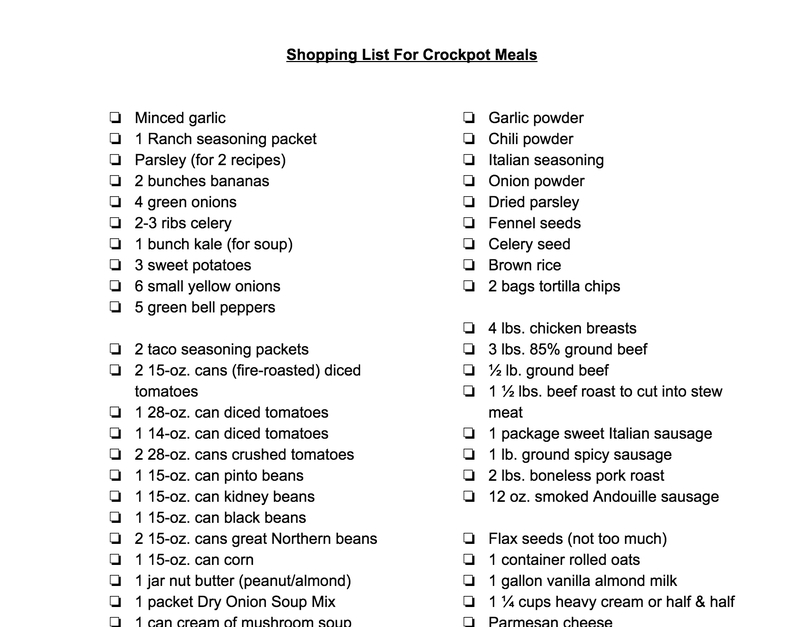 I also typed up a list of the recipe names, and how many freezer bags each would make, as well as what ingredients would be needed “day of” — either to be added to the crockpot (some recipes require that) or ingredients needed as a side dish! PS — This is only part of the big shopping list. 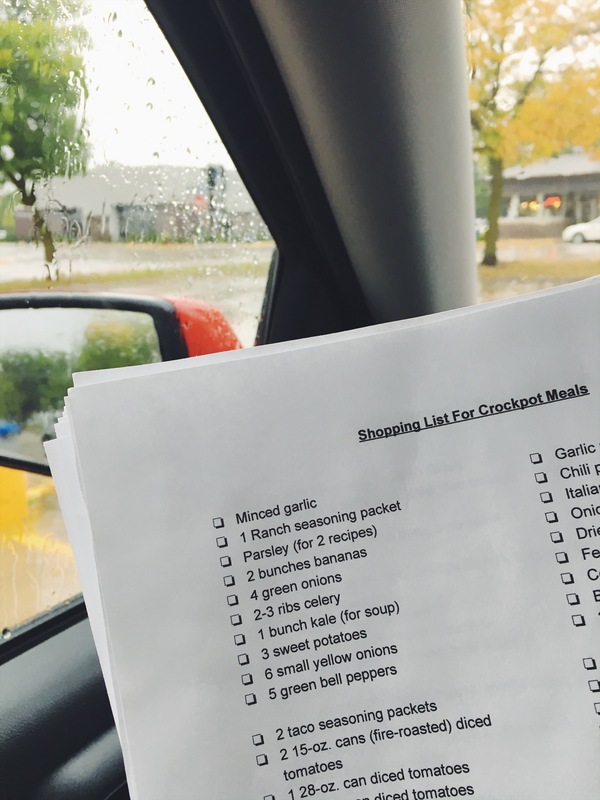 If you’d like a copy of my actual shopping list for all of the above meals, just shoot me an email at justbeeblog@gmail.com and let me know! I listed all the ingredients needed except for some basic ones we already had. A lot of crockpot meals have overlapping ingredients. I bought a lot of bell peppers and onions, and had a good amount of the same meats and spices to purchase. Another thing: I ALWAYS write my grocery lists in order of how I walk through the store. I start with produce, then canned items, then meat, then spices/baking needs, then refrigerated section, then freezer aisle, then breads or cereal items. Doing this will save you TONS of time (and energy), so you won’t be running back and forth through the store. Trust me – I was already totally wiped by the end of my shopping trip and I was marching along right in order of my list and the store the whole time! Ahhhh!! But it will get better! 🙂 All the chaos is worth it in the end. 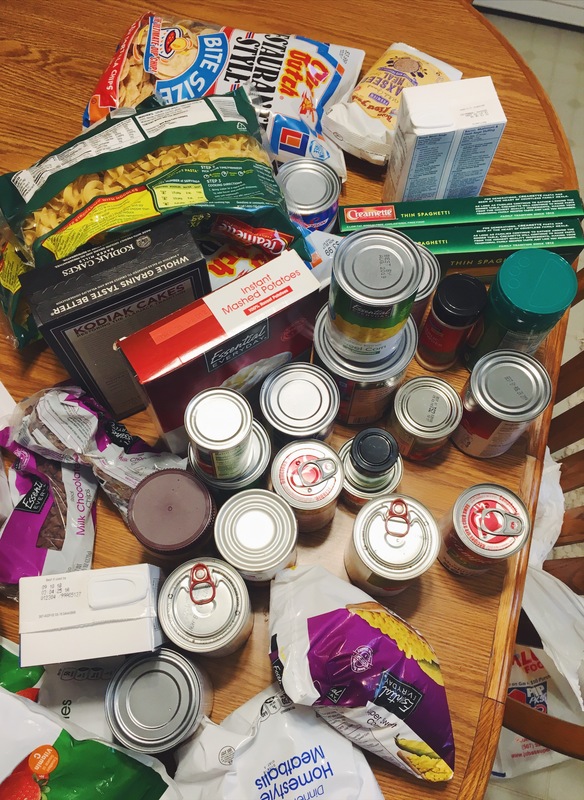 1 // I put all of the ingredients away from my shopping trip, either in the fridge or the cupboard. Some people may not like to do this before meal prepping, but I’ve found it personally helps me. I like to know where each ingredient is so I avoid searching or digging. 3 // Next, I labeled the gallon-size freezer bag with a Sharpie. On my freezer bags, I like to put the date, the recipe name, the number of servings, and instructions. I will still have the printed recipes to refer to the day of, but I like to write any simple instructions on the freezer bag itself when I can. Even something like “Low 6-8 hours – serve over rice” is helpful! 5 // Time to load the bag with all the ingredients! I always load the spices, veggies, and things like the beans or canned tomatoes first, placing the meat in last. I do it this way because then the meat is the first item dumped into the crockpot and therefore has an even better chance of getting cooked thoroughly (though that’s not really a worry with these super long cook times). For anyone wondering, it IS okay to freeze raw meat with veggies, etc. 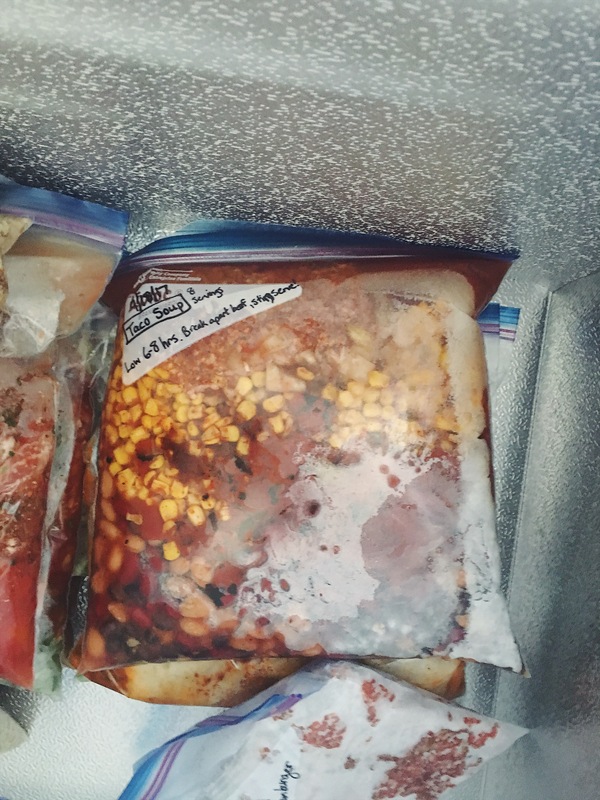 The temperature of the freezer and the ziploc bags themselves won’t allow the meat to contaminate things – and all of the meat and veggies will get cooked very hot and very thoroughly anyway! ** Whenever I handle raw meat, I obsessively wash my hands, I don’t touch anything else if I can help it, and I sanitize the work station multiple times. It’s just worth it to me!! Raw meat is something many of us choose to deal with, and I love meat, but I want to avoid any chance of making anyone sick by having a gross work station! 7 // I finish by sanitizing the work station. I’m okay with leaving a cutting board and chef’s knife out to use again, if all they’ll be used for is fresh produce, but anything involving meat gets its own area of the work station – plus I make sure everything is continually wiped well and free of meat residue! 8 // Then, once my work area is cleaned and mostly cleared off, I turn to the next recipe page and start all over again! ** The question was asked about whether you must thaw the bags out or not — I usually just select my meal the night before and move it from the freezer to the fridge overnight. Then, in the morning, I just set the bag in the sink and run hot water over it for a little bit! That usually allows me to break it up into a couple big chunks or it loosens it enough to slide it out of the bag into the crockpot! But, there have been times I’ve forgotten to thaw the meal in the fridge overnight, and it has still usually worked out just fine to thaw the bag under/in hot water the morning of. I also prefer using disposable crockpot liners when it’s time to actually cook the meals. It saves me a lot of time and effort in soaking/scrubbing the crockpot out later! My prep session this week resulted in 13 gallon size freezer bags, plus all of those lactation smoothies! I was quite tired and achy by the end of the afternoon, but I just kept thinking how grateful I’ve been to have freezer meals in the past, and how grateful we’ll be for these meals once our baby is here! They really make life easier. There you have it, friends! I hope you enjoyed reading about the whole process, as well as seeing the recipes I selected! 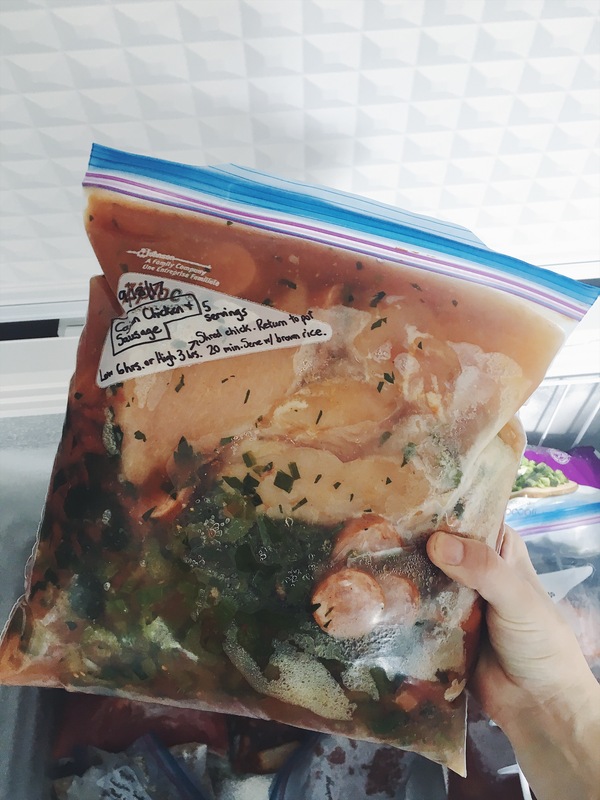 Best of luck to you in your own freezer meal prep! Do you like to prep freezer meals?? Please share your favorite recipes below!! Thank you, Jordan!! 🙂 I’m excited about having meals prepped, too! It brings me a sense of relief and helps me feel a tiny bit more prepared! 🙂 I’d love to hear of any of your favorite crockpot recipes, too! I had really really planned on doing this with my first and then put it off until the weekend before my c-section date. Well she decided to come a week before my scheduled c-section. Freezer meals weren’t made, dogs weren’t bathed, and house wasn’t clean. Really hoping I get around to making sure those things are done ahead of time this go around haha.